This may be one of the more unique indie games I've seen in a while. Clewcat Games' Axe, Bow and Staff is a runner with RPG mechanics, and is kind of incredible in its own way. 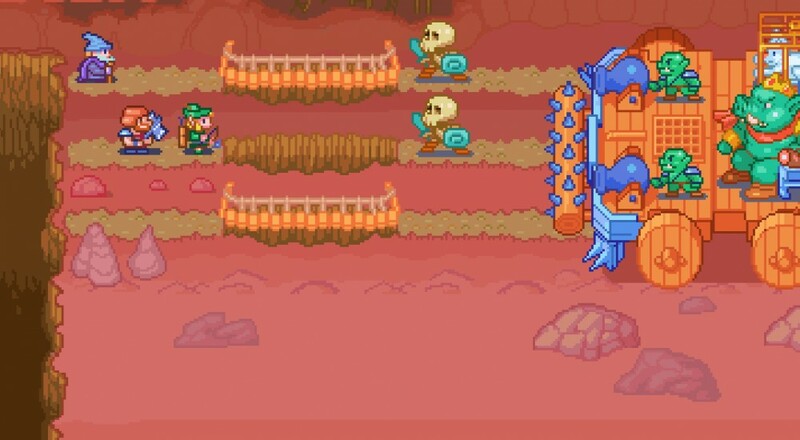 Like all runners, much of Axe, Bow and Staff's gameplay is focused on successfully making your way through a level without ever stopping. You'll encounter enemies, rocks, bushes, barrels, and other obstacles that will attempt to impede your progress. If you get held up for too long, you'll get pushed off the screen and die. Fortunately, you've got some abilities to help you out. The three titular characters can slash, shoot, or teleport enemies out of the way, or move across three lanes to avoid them altogether. You can also level up your abilities, buy consumable items, and even new gear for each of the three heroes. Best of all, you can play through the whole thing with up to two other players! Axe, Bow and Staff is available on Steam for just $6.99, a 30% discount from its regular price, until October 6. It supports three player co-op locally or online throughout the main game mode, and also features a more competitively focused race mode. Page created in 0.7579 seconds.